Rose loves the island on which she lives, never hesitating when a trip to an interesting place on it is on offer - which is often. She also loves combining the two passions that capture her interest - photography and writing. If the truth be told, perhaps the interest in photography harks back to the days when she hesitatingly held a box brownie in her hands and peered down into the lens to take the old black and white photographs - and the interest in writing may have remained dormant in her subconscious from the time when she wrote a school essay, not thinking much about it, as it was only about the adolescent, her, sitting on the back steps in the sun outside her childhood home talking about the domestic fowl; chooks and ducks that were scattered about the back yard and what they got up to - and her father's vege plot - but the story made an impression on the teacher - and in turn his surprising positive verbal reaction obviously made a lasting impression on her. A simple context, yes, but an experience that extended when freed from the subconscious to a burgeoning life-change. Always on the lookout for interesting or unusual images, something that will embed the story, the camera is always ready nearby waiting for that magic moment to come - and if she's quick enough, she can capture it. In her first of several local travel books, in which images and text combines to make interesting stories, the below-mentioned book is her first release in this genre. 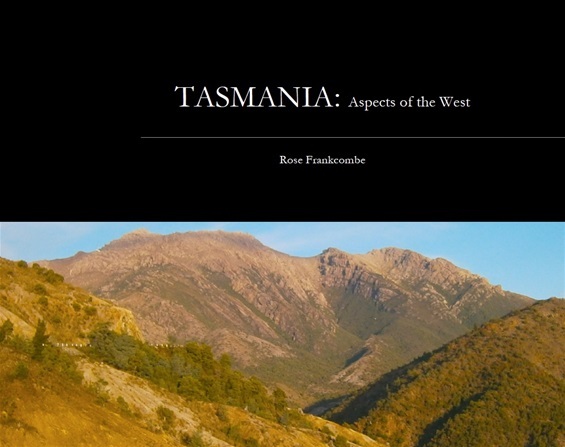 Is a publication in which Rose recounts in photo images and words elements of the west coast of Tasmania, including anecdotal and historical comments on the various places visited. From Queenstown to Strahan, the Pieman River and Arthur River. Come on a journey, too. Travel through the pages to see what these wonderful places have to offer. Rose expects a series of TASMANIA books will follow. TASMANIA: Aspects of the West is the first in a series of photo travels with historical anecdotes to interest the reader.